Lightly oil two pizza pans or two cookie sheets. TIP: Instead of greasing the pans, you can layer them with sheets of parchment paper. This will also ensure the pans are GF. In mixer bowl, fold all ingredients together and then beat for two minutes. Remove bowl and cover dough with plastic wrap. Let rise in warm place for 40 minutes. TIP: Heat your oven to 170°. Then turn off the oven and place the bowl inside with the door open. After 40 minutes, remove dough from bowl and spread on your pizza pans or cookie sheets. TIP: The dough will be too sticky to roll. Use a metal spatula or icing spreader to spread the dough out thinly and evenly. MEGA-TIP: Make awesome cinnamon rolls for dessert with any left over dough! If you like thin crust pizza, you’ll have left over dough. Spread it out on parchment paper. Dot it with butter and sprinkle with cinnamon and sugar. Cut into 2 inch slices. Roll up the slices and place in a greased muffin tin. Bake at 350° for 20 minutes while you are enjoying your pizza. Serve fresh from the oven with butter. Now you have your dough ready to go and it’s time for the fun part. Cover the dough with a layer of gluten free pizza sauce. We use Catelli pizza sauce, which you can find at any grocery store, or we make our own while the dough is rising. Click here for a recipe for the Best Ever Gluten Free Pizza Sauce. Now add your toppings. 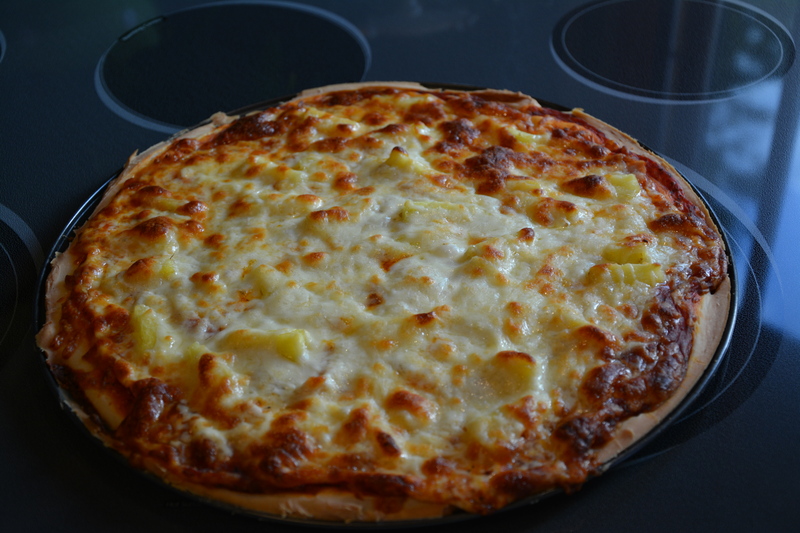 We like Hawaiian pizza, so we add sliced Grimms Honey Maple Ham and fresh chopped pineapple. Bake your pizzas in a 400° oven for 15-20 minutes. Let cool for 5 minutes. Slide onto a cutting board and slice. ENJOY! FINAL TIP: GF foods tend not to reheat very well. If you want really good leftover pizza, heat it in a buttered frying pan, covered on low to medium heat. If the pizza’s frozen, defrost it first. This entry was posted in Lunch and Dinner, Recipes and tagged Dough, GF Pizza, gluten free, gluten free cinnamon rolls, Gluten Free Pantry French Bread and Pizza Crust Mix, gluten free pizza, Gluten-free diet, Glutino Pizza Mix, Pizza. Bookmark the permalink. Sounds wonderful and simple! Have you ever made the pizza crust without the yeast? If so, how did it turn out? No I haven’t made it without the yeast. We have, though, used our tortilla recipe to make small 4 inch pizza crusts. Turns out pretty good. You don’t cook them first. Just press them out and top with your topping and bake.